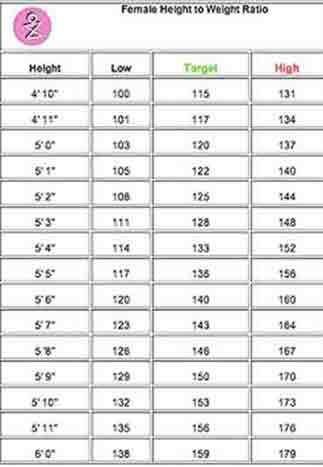 Calculate your ideal weight to height ratio with these charts from disabled world. 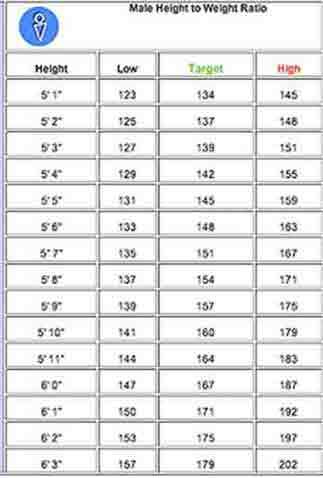 Keeping a check on your weight to height ration can help you avoid obesity and related complications. Health experts worldwide agree that if you are overweight and haveweight related medical problems or a family history of such problems, you can benefit from bringing your weight down to normal levels. Even losing 10 to 20 pounds can improve your overall health, lower blood pressure and cholesterol levels. Maintaining a healthy weight is important in the fight against premature aging and age-related illnesses, especially those which are related to obesity. If, on the other hand, you are less than your ideal weigh you may need to put on weight as part of a well balanced diet. In both cases you should consult your health professional if you have symptoms which are causing concern.